25-27 Massachusetts is located on the west side of Massachusetts Avenue, between Beacon and Marlborough, with 491 Beacon (21-23 Massachusetts) to the north and 27½-29 Massachusetts to the south. 25-27 Massachusetts Avenue was designed by architect Ernest N. Boyden and built in 1891 by John Hurley, builder, as a three-family building and store. It was built for real estate dealer Seth Russell Baker, one of three contiguous multi-unit buildings built for him at the southwest corner of Beacon and Massachusetts Avenue: 25-27 Massachusetts Avenue, 491 Beacon (21-23 Massachusetts Avenue), and 495-497 Beacon. Also in 1891, Ernest Boyden designed three multi-family dwellings for Seth Baker at 479–481–483 Beacon (483 Beacon was razed for construction of the Hotel Cambridge in 1898). Seth Baker is shown as the owner of 25-27 Massachusetts Avenue on the original building permit application, dated February 28, 1891. 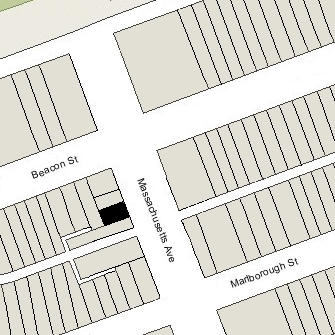 On the application, the address is shown as 466-468 West Chester Park; it changed to 25-27 Massachusetts Avenue when West Chester Park was renamed on March 1, 1894. Seth Baker purchased the land for 491 Beacon (21-23 Massachusetts Avenue), 25-27 Massachusetts Avenue, and 495-497 Beacon in two transactions. On April 25, 1890, he purchased the corner lot, with a frontage of 44 feet on Beacon and 93 feet on Massachusetts Avenue, from Henry Lee, H. Hollis Hunnewell, and Augustus Lowell, and on May 3, 1890, he purchased the lot to the west, with a 28 foot frontage on Beacon, from Oscar L. Stillings. Oscar Stillings had purchased the lot on August 14, 1888, from Henry Lee and his partners. All of the land originally had been part of a larger parcel that Henry Lee and his partners purchased on February 20, 1883, from a real estate investment trust formed by Grenville T. W. Braman, Henry D. Hyde, and Frank W. Andrews. The parcel was one of several tracts of land the trust had purchased from the Boston Water Power Company on March 1, 1872. In subdividing their land, Henry Lee and his partners had created two passageways to provide access and drainage to the alley: a four foot wide passageway at the rear of 499 Beacon and 501 Beacon, connecting with a six foot wide passageway extending south behind 29 Massachusetts Avenue. Unlike similar passageways elsewhere in the Back Bay (for example, at the rear of houses facing on the side streets), these passageways were not created as easements over the lots, but as separate open spaces “appurtenant to the granted premises” to which each property owner had access in common with the owners of the other the abutting properties. Click here for an index to the deeds for 25-27 Massachusetts Avenue, and click here for further information on the land west of Massachusetts Avenue between the south side of Beacon and the north side of Commonwealth. 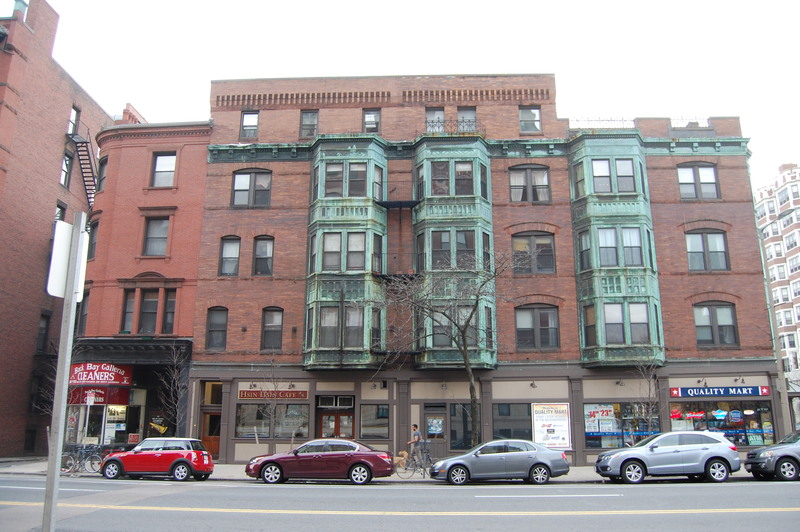 Seth Baker sold all three buildings soon after they were completed: 25-27 Massachusetts Avenue in July of 1891, and 491 Beacon and 495-497 Beacon in October of 1891. The deeds included a three and one-half foot wide easement across the rear 495-497 Beacon and a six foot wide easement across the rear of 25-27 Massachusetts Avenue, connecting to the passageways leading to the alley. 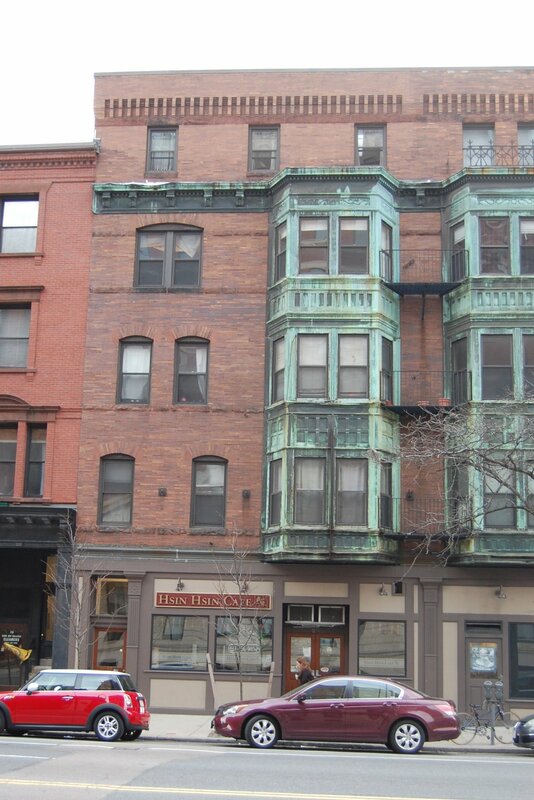 On July 27, 1891, 25-27 Massachusetts Avenue was purchased from Seth Baker by James Edgar Moore, who lived in one of the apartments and operated a provisions store there with his partner, Orrin R. Tweed. James Moore married in August of 1893 to Mrs. Annie Delight (Souther) Graves, the former wife of Edwin Graves. After their marriage, they lived in Brookline. By 1897, an additional (fifth) story had been added to 25-27 Massachusetts Avenue and to 23 Massachusetts Avenue. James Moore continued to operate his provisions store at 25-27 Massachusetts Avenue with Orrin Tweed until September of 1901, when they dissolved their partnership and he continued alone. Annie (Souther) Graves Moore died in November of 1903. James Moore continued to live in Brookline and operate his provisions store at 25-27 Massachusetts Avenue. He married again in December of 1923 to Anna Estella Johnston Sederholm. They lived in Brookline after their marriage. On April 17, 1924, James Moore transferred 25-27 Massachusetts Avenue into his and his wife’s names. On August 2, 1926, 25-27 Massachusetts Avenue was acquired from James and Anna Moore by Florence M. (Pickering) Baker, the wife of Chester A. Baker, who was a retail druggist at 29 Massachusetts Avenue. She conveyed the property on the same day to the Chimes Spa Company. James Moore died later that month. The Chimes Spa was a restaurant at 328 Massachusetts Avenue (corner of Huntington). It was owned by the Caracostas family, who were confectioners doing business as Caracostas Brothers. The partners were Angelo (Evangelos) E. Caracostas, John (Johannes) E. Caracostas, James (Dimitrios) E. Caracostas, and Peter (Panagiotis) E. Caracostas, all children of Efstradios and Irene (Erini) (Kuses) Caracostas. The Caracostas Brothers also owned The Esplanade Restaurant, which had leased 23 Massachusetts Avenue since about 1924. After acquiring 25-27 Massachusetts Avenue, they expanded The Esplanade Restaurant (later the Esplanade Café) into 25 Massachusetts Avenue. On July 3, 1927, Chimes Spa transferred 25-27 Massachusetts Avenue to John Charles Pappas (Papadopoulos). He was an attorney in Watertown and his sister, Mary, was the wife of Peter Caracostas. John C. Pappas later would become an associate justice of the Gloucester District Court and also would become a grocery and liquor dealer and importer. In 1946, he and three partners purchased the Suffolk Downs race track; they continued to own it until 1964. On September 1, 1927, John Pappas transferred 25-27 Massachusetts Avenue to Caracostas Brothers, Inc.
At about that time, Louis Pappas (Elie Papadopoulos) joined Caracostas Brothers. He and his wife, Frances Sarah (Herron) Pappas, lived in Watertown. He does not appear to have been a close relative of John C. Pappas and his sister, Mary (Pappas) Caracostas, the wife of Peter Caracostas. By 1939, Louis and Mary (Herron) Pappas had moved from Watertown to an apartment at 27 Massachusetts. By 1941, he was president, treasurer, and manager of Caracostas Brothers, and by 1947, the firm had changed its name to Esplanade Café, Inc. In June of 1949, Esplanade Café, Inc., purchased 495-497 Beacon. In October of 1949, Louis Pappas filed for (and subsequently received) permission to construct an addition at the rear of 25 Massachusetts Avenue, connecting with the rear wall of 495-497 Beacon. At about this time, the Esplanade Café terminated its lease at 23 Massachusetts Avenue and opened its Zebra Lounge (with live entertainment) at 495-497 Beacon. 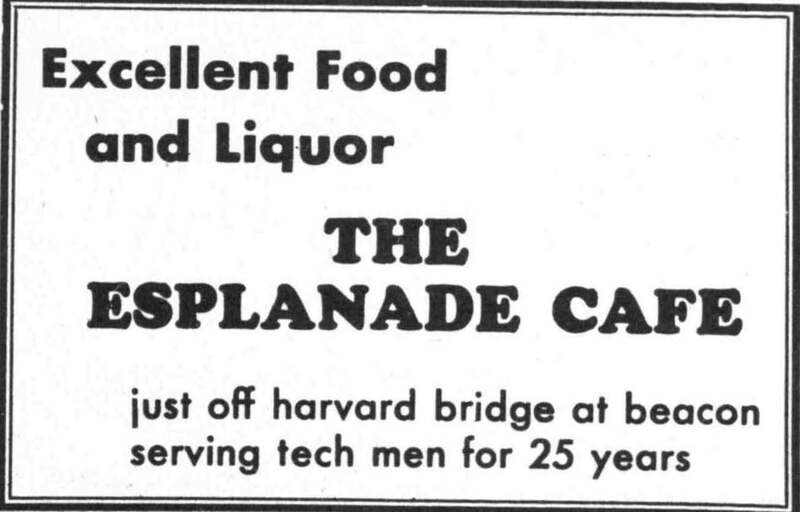 In November of 1950, when Louis Pappas applied for annual renewal of the Esplanade Café’s license to serve alcoholic beverages, the application indicated both 25 Massachusetts and 495 Beacon as the licensed premises (previous applications had indicated 23-25 Massachusetts Avenue). Louis Pappas died in January of 1953, and Frances Pappas moved from 27 Massachusetts Avenue soon thereafter. The Esplanade Café continued to be located at 25 Massachusetts Avenue and 495 Beacon until the mid- to late 1950s. In March of 1959, 25-27 Massachusetts Avenue and 495-497 Beacon were purchased from Esplanade Café, Inc., by I. J. Kennedy, Inc. In 1961, Kennedy Café Inc. opened The Crossroads of Boston restaurant and bar at 495-497 Beacon and at 25 Massachusetts Avenue. In December of 1961, 495-497 Beacon and 25-27 Massachusetts Avenue were acquired from I. J. Kennedy, Inc., by Edward J. Goodfellow. He and his wife, Mary Dorine (Jewers) Goodfellow, lived at 119 Commonwealth. He was the owner of the Colonial Lounge Bar at 981 Tremont in Roxbury. By 1963, 25 Massachusetts Avenue was the location of the Chung Sai Restaurant. The Crossroads continued to operate at 495 Beacon. In December of 1966, Edward Goodfellow transferred the rear six feet of 25-27 Massachusetts Avenue (the rear yard over which the easement for access to the alley was located) to 495-497 Beacon. The transfer added 180 square feet to 495-497 Beacon (increasing the lot size from 2,232 sf to 2,412 sf, and reducing the lot size at 25-27 Massachusetts Avenue from 1,441 sf to 1,261 sf). The 6 foot wide strip was enclosed with a wall at the southern end, with a door in the wall to provide access to the passageway for 25-27 Massachusetts Avenue and 491 Beacon. The new lot lines were contained in a plan by William S. Crocker, Inc., surveyors, and filed with the Land Court on December 16, 1966. In March of 1967, 25-27 Massachusetts Avenue was acquired from Edward Goodfellow by Bertha (Levitt/Leavitt) Miller, the widow of Max Miller. She owned 491 Beacon where she operated the Miller Drug Company. She lived in one of the apartments at 491 Beacon, and her son and daughter-in-law, Eugene and Susan (Lement) Miller, lived in another. Eugene Miller managed the store. Edward Goodfellow continued to own 495-497 Beacon and, as part of the transaction, he agreed that the occupants of 25-27 Massachusetts Avenue would continue to have access to the passageways connecting to the alley through the existing door in the southern wall across the six foot wide area that had been transferred from 25-27 Massachusetts Avenue to 495-497 Beacon. He also agreed to construct a separate party wall, against the face of the existing western wall of 25-27 Massachusetts Avenue, along the 30 foot boundary between the two properties and entirely on 495-497 Beacon’s land. The storefront at 25-27 Massachusetts Avenue continued to be occupied by a restaurant. Bertha Miller died in January of 1973. 491 Beacon and 25-27 Massachusetts Avenue were inherited by her three sons: Eugene, James, and Sidney Miller. The Miller Drug Company closed at about the same time and Eugene and Susan Miller moved elsewhere. On May 31, 1979, 491 Beacon and 25-27 Massachusetts Avenue were purchased from the Miller family by David G. Ricupero. In March of 1981, David Ricupero filed for permission to combined 491 Beacon and 25-27 Massachusetts into one property, with the address to be 491 Beacon and the combined occupancy to be eleven apartments, a retail store, and a restaurant, which he indicated was the existing occupancy. He subsequently abandoned the permit. 25-27 Massachusetts Avenue remained a residential and commercial building in 2018.